Numerous gifts and entertainment for Mother’s Day. City Centre Bahrain is celebrating women during the month of March, with special treats on Mother’s Day to honour all mothers in Bahrain. Style and spring fashion have arrived for all, but on Mother’s Day, mothers have their first pick at new trends and collections at City Centre Bahrain , with a wide variety of high street and designer brands. Mothers are hard-working members of our society in the work place and in our lives at home, so take this day to honour, thank and spoil them for a job well-done with City Centre Bahrain ’s in-mall and social media celebrations. From March 18th to the 21st, visitors can treat their mothers with a “Mom, I Love You” Gift Card. The first 100 shoppers who purchase a BD 70 Gift Card will receive a complimentary spa treatment from Pure Spa Kempinski Grand & Ixir Hotel, City Centre Bahrain . 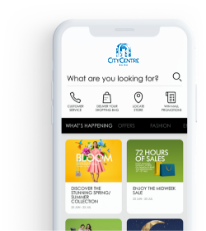 Fans can visit City Centre Bahrain ’s Facebook page to create a personalized Mother’s Day post card, which will be created online, printed and post mailed to any country. By clicking on the “Dear Mom” icon and following simple steps to write a note, fans can upload a picture and fill in mailing address details. Throughout the month of March, shoppers can enjoy the spring themed decor of City Centre Bahrain with live performances and gift vouchers. A “Spring Flower Girl,” dressed in a spring themed outfit accessorized with flowers, will be promenading around the mall handing out flowers to shoppers. Every flower will contain instant gifts to numerous offerings from the mall and selected retailers. Shoppers can also win the grand prize shopping spree worth BD 5,000 upon spending BD 33. Upon spending BD 50, shoppers can win a key to Unlock Your Spring Wardrobe to open a box of Gift Card prizes worth BD 5,000.